KABUL: Afghan officials said five men killed in a US-led raid Sunday were all civilians, countering a statement from the military that said they were militants from a "terrorist network." The claim was the latest in a string of allegations of civilian casualties at the hands of foreign forces who are in Afghanistan to fight against insurgents, including Taliban and Al-Qaeda extremists. "Afghan and coalition forces killed five militants and detained four suspected militants early this morning in Kunduz province during an operation targeting a terrorist network in northern Afghanistan," the US military said. The operation took place near the border with Tajikistan, it said. 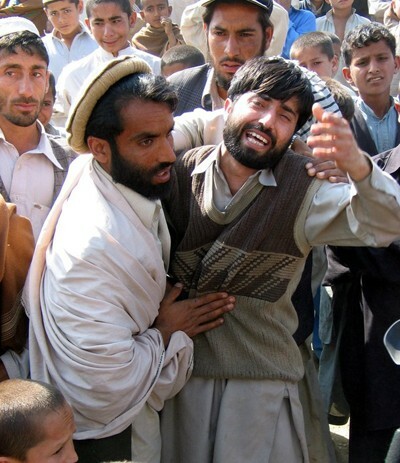 But provincial police chief Abdul Rehman Actash said the five men killed were civilians visiting a district mayor. "They went into the mayor's house and killed his driver, two guards, his cook and a guest from Sari Pul province, and confiscated two weapons from the house," Actash told AFP. He said police did not know the target of the attack, contradicting the US statement that the operation was carried out in coordination with local police. District mayors are the people in charge of local reconstruction. Afghanistan's interior ministry also said the dead were civilians and that it had sent a delegation to the area to investigate the incident. There are around 75,000 international troops in Afghanistan to help the government fight the growing insurgency. The Afghan government has repeatedly expressed anger over civilian deaths during foreign military operations, mounted in a bid to defeat an insurgency led by remnants of the Taliban regime ousted in 2001. The United Nations said in February that a record 2,118 civilians were killed in the Afghan conflict in 2008, with nearly 40 percent of the deaths caused by pro-government forces, including US-led and NATO troops. Elsewhere, a bomb ripped through a vehicle carrying labourers to work in eastern Khost province on Sunday, killing one worker and wounding 11 other people, police said. The bloodshed follows a string of deadly attacks in recent days with US President Barack Obama poised to unveil a new strategy hoping to turn the tide in a war that has dragged on for more than seven years. Half a trillion dollars of military assistance and $57 billion in direct aid seem to have had little impact on the nation's economy. One in 3 Afghans lives on less than $1 a day, the UN says.